Historians and sociologists have made us familiar with the social and economic implications of the unprecedented scale of urbanisation in the nineteenth century. 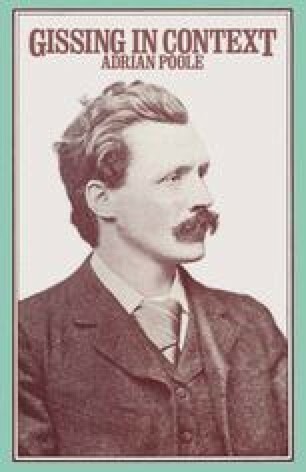 This chapter and the specific studies of Gissing’s early novels that follow will be concerned with the human consciousness of the city, as it finds expression in various writers and works throughout the century. In the changing experience and interpretation of life in the city are concentrated several interrelated images and issues that become in the end inseparable: the visual images of the city, of physical scenes and locations, rooms and streets; images of individuals, crowds, masses, classes and communities; problems of relationship, and the desire for knowledge and love; and beneath all these, the issue of language, of finding words and styles to explain these experiences to oneself and to others.